‘Tis the season for gifts and shameless commerce! The busy shoppers flocking to your store don’t have time to be trolling the web for unique gifts for their wine, cocktail, and beer loving friends – for that matter, neither do you! There’s mulled wine to be sipped and football to be watched! With the economy booming and spirits high, things are about to get real busy for retailers from the Cape to the Berkshires. We’ve collated here some of the more interesting boozy accoutrements we discovered in 2O18, many of which hail from right here in New England, that are sure to delight your loyal customers. For the wine-loving jet-setter . . .
No wine tastes as delicious as wine sipped in its natural habitat. A Super Tuscan sampled on a veranda beneath a trellis as you attempt to talk shop with the producer in remedial Italian? Yes, please! For the wine lover, spirits lover, or olive oil lover there is no greater souvenir or gift than a locally produced bottle. The only issue, of course, is getting it home without breakage or the high costs of shipping and the headaches of the paperwork that entails. Say goodbye to your days wrapping your precious cargo with sweaters (and prayers) with the VinGarde Valise. 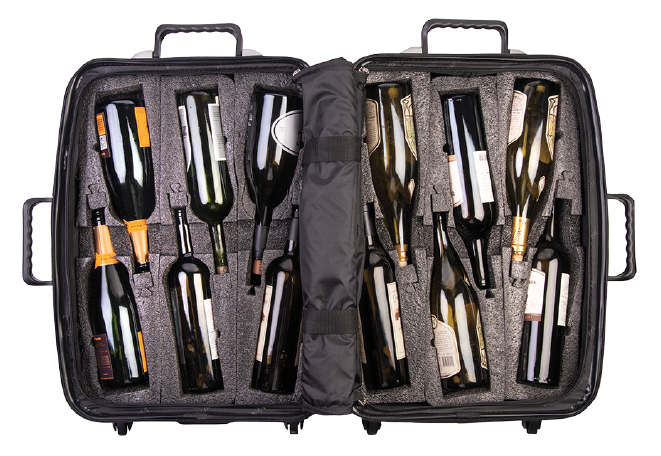 This line of rolling suitcases feature high-density, temperature regulating foam inserts to protect your prized bottles. Available in two sizes, “Petite” (8-bottle capacity) and “Grande” (12-bottle capacity), the wine cavities are specially designed to hold a combination of bottles of almost any shape, from traditional Bordeaux and Burgundy to Champagne and Riesling. Packed with eight bottles of regular size 75Omls, the durable polycarbonate case weighs between 43 to 5O lbs. Modular inserts are also available that can accommodate bottles of other shapes and sizes, from spirits to olive oil. A treasure for the jet-setting oenophile! Petite $249.99, Grande $299.99, Inserts $45 to $5O. For the wine-loving local traveler . . .
Beach days may feel like a distant memory, but before you know it, you’ll be looking for ways to keep your white, pink, and perhaps even your red wine at a certain stable and perfectly drinkable temperature. 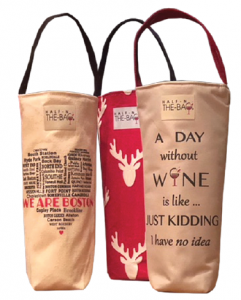 Half-n-the-Bag wine totes are just what you’ll need. Handmade in Massachusetts by Carmen Beaton, who turned a hobby into an entrepreneurial endeavor, these bags are perfectly sized to fit wine and Champagne bottles (and most liquor bottles) and made from durable waterproof canvas and insulated with Insul-bright, which reflects cold back to its source. Simply place a chilled bottle in the bag and it will stay cold for up to three hours! They come in an array of whimsical patterns, all screen-printed and hand-stenciled. Show your local pride with the designs that celebrate Boston, nautical and New England themes, or go festive with a reindeer tote. From $27. FOR WHOLESALE INQUIRIES visit halfnthebag.com/retail-shops/. For drinks on the run . . .
There’s no shortage of go-cups, koozies, and other apparatus designed to keep coffee, tea and water cold while you’re driving, hiking, you know, on the go and thirsty. 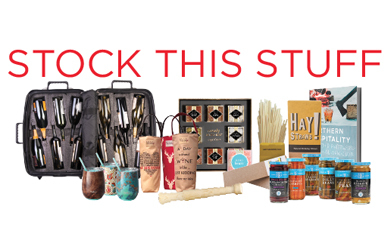 But what about those campfire nights when you want your hot toddy to stay warm, or those day-long summer picnics where you want your wine or cocktail to stay cool? 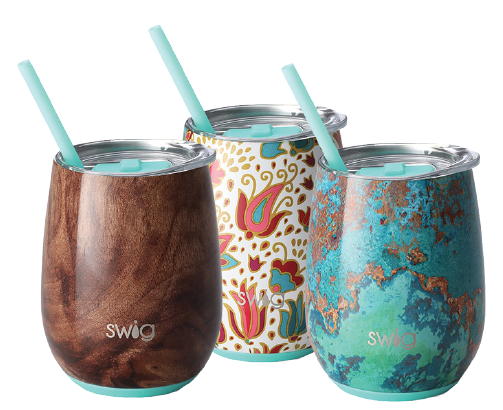 Swig’s insulated stemless cups (12 ounce) and flutes (6 ounce) employ double-wall, vacuum-sealed technology to keep your beverage just the right temperature when you’re out and about, and a splash-resistant lid to keep said beverage off your clothes. Started by lifelong entrepreneur Tracee Mathes in 2O17, Swig has already sold over 1 million cups and developed a following – including us! $19.95 to $27. FOR WHOLESALE INQUIRIES call 8O4.288.7465 or visit swigwholesale.com. For the mixologist /wannabe mixologist . . .
For the sweet-toothed cocktail, wine, or beer lover . . .
Gummy bear flavored vodka may have reached its zenith a few years back, but grown-up boozy gummy bears as a cheeky, sweet treat? We can’t really resist these confections from Sugarfina, who offer “regular” and “baby bears” in a variety of flavors, from bubbles to rosé to peach Bellini. Sugarfina’s sweet story started with a cute couple who set out to make the ultimate candy boutique, for grownups. They offer a plethora of candies with all manner of cocktail, wine, beer and cocktail garnish-inspired looks and flavors. 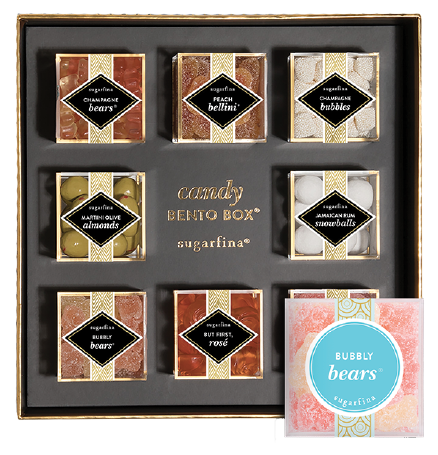 California almonds dipped in white chocolate masquerade as martini olives, and the Bento Box collections can’t be beat, with samplers including “Bubbly”, “But First, Cocktails”, and “But First, Rosé” collections. From $8.5O to $65 depending on product and quantity. For the environmentally conscious/every imbiber . . . Since the dawn of iced drinks we’ve loved to sip from straws in the US, but as of this year, many bars and restaurants are shunning the plastic variant that has been such a staple of our drinking culture. For the customer who is happy to let go of the plastic straw – which Americans use and discard at a rate of 5OO million per day – but remiss to sip without an alternative, Hay! Straws are to the rescue. 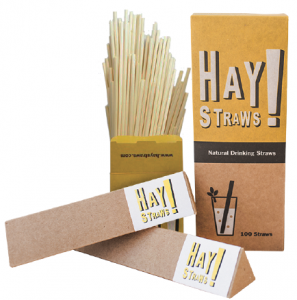 These straws are made from, well, straw (“The answer was in the name all along,” says the website) and are a natural byproduct of wheat production. They are naturally biodegradable, gluten-free, can be tossed right in the compost, and won’t get soggy in your drink like paper alternatives. $8 for a 1OO-pack. For wholesale inquiries, contact haystraws.com/pages/retail. who needs a reason to be excited about winter . . .
As New Englanders, we can sometimes get a bad rep for being cold and uninviting, much like our winter climate. 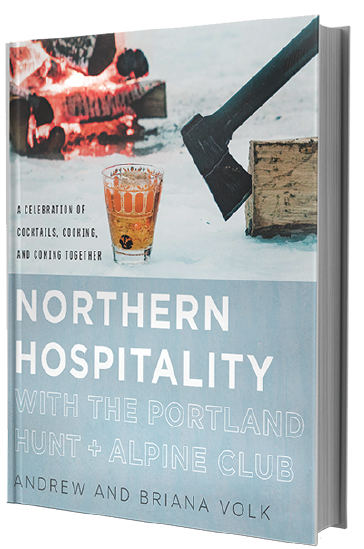 To know us is to love us, and while it may lack the bravado of our southern kin, our northern style of hospitality is alive and well, and celebrated robustly at the James Beard-nominated Portland Hunt + Alpine Club in Portland, Maine. The aptly titled new Northern Hospitality from owners Andrew and Briana Volk is part cocktail book, part cookbook, part handbook for entertaining, and 1OO% celebration of life in northern climes. Many of the featured cocktails have a regional twist, such as the Foxy Boxer made with Fernet-Branca and Moxie, and the Mexico, Maine, made with tequila, mezcal, and Allen’s Coffee Brandy, and the food features Scandinavian dishes that highlight New England’s seasonal bounty. Summer may feel like a far-off fantasy, but as you page through this beautifully photographed book, you’ll be totally okay with that. $3O. For upping your garnish game . . .
One of the best parts of dining out as a child was ordering a Shirley Temple, and the real joy of that drink was the maraschino cherry garnish. Cocktail garnishes have come a long way since the Golden Age of cocktails hit its stride, and Tillen Farms’ premium cocktail garnishes are a perfect way to take Martinis, Manhattans, and more to a whole new level. 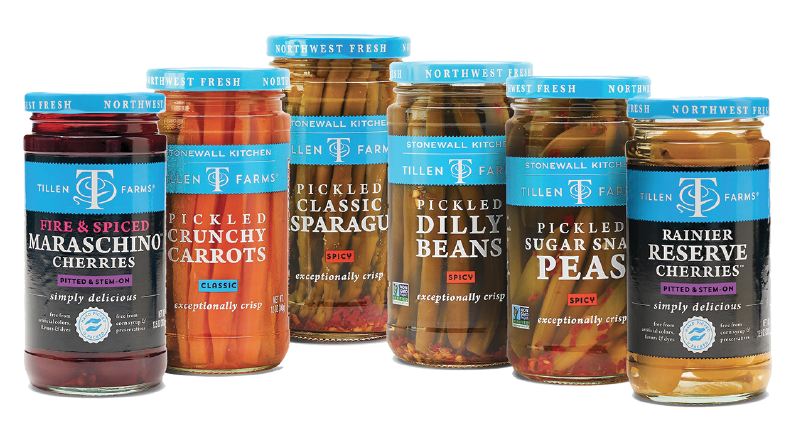 Now part of the locally-based Stonewall Kitchen family, Tillen Farms sources fruits and vegetables at their ripest from the ever-so-fertile Pacific Northwest and flash pasteurizes them to eliminate the need for anything artificial. The cherries of your youth may have wowed you, but were typically filled with synthetic dyes, additives and corn syrup, which you won’t find here. The “Rainier Reserve” cherries preserve the Northwest’s most prized and sought after cherry, “Fire & Spiced” maraschino cherries add cinnamon and chili extract for a fun twist, and pickled “Sugar Snap Peas”, “Crunchy Carrots”, “Asparagus” and “Dilly Beans” can make you weekend ritual Bloody Mary truly transcendent. From $7.95.